Place waxed paper on a large work surface where you will build your rainbow. 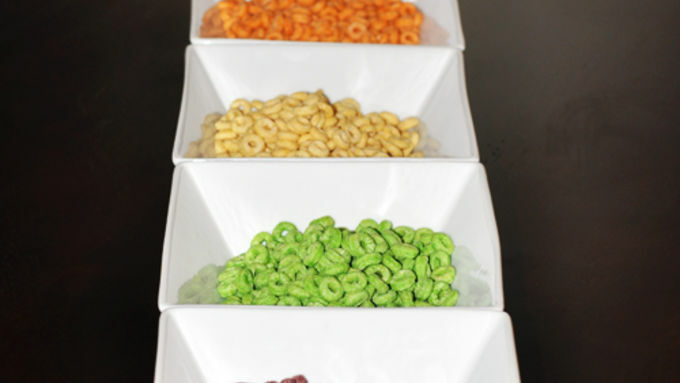 Separate Fruity Cheerios™ into five colors. You need 1-1/4 cup of each color. In microwave-proof bowl, put 10 large marshmallows and one pat of butter (about 1-1/2 tbsp). Microwave on high for 45 seconds. Remove from microwave and stir. Return to microwave and cook another 45 seconds on high. Remove marshmallow mixture from microwave and stir it well, until it is smooth and completely mixed. It will be very liquid. Add 1-1/4 cups of the purple cereal to the marshmallow mixture. Mix well and place on waxed paper to cool just a bit. Spray hands with cooking spray. When mixture is cool enough to handle but still warm enough to shape, mold the mixture into a long rope and place it in an arc around a 7 inch diameter bowl, pressing and pulling the cereal mixture until it is uniform thickness. Repeat Steps 2-4 for the other colors in this order: green, yellow, orange and red. Press each color to the one before it so the colors stick to each other to form the rainbow. 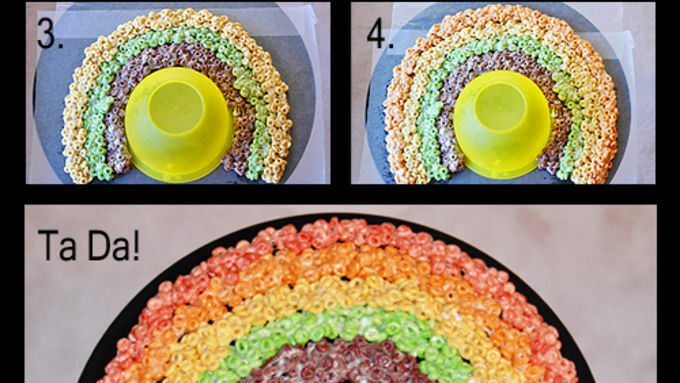 Allow the rainbow to set completely before moving to a tray. Cut into thin slabs to serve. Store uneaten bars in an airtight container. Microwave ovens vary greatly so watch marshmallow mixture closely if you have a high-powered microwave. Turns out, Fruity Cheerios are good for a whole lot more than doing the back stroke in a bowl of milk. 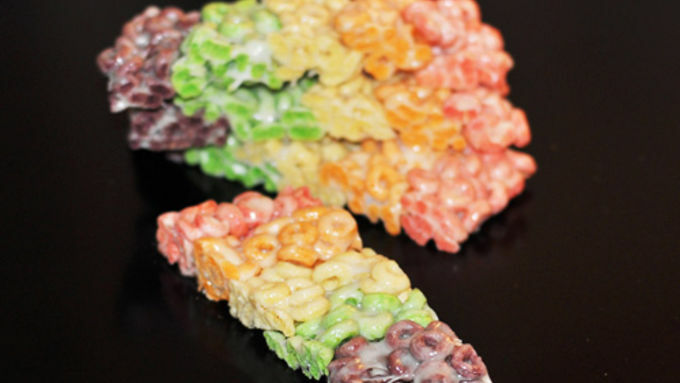 These colors were meant to morph into rainbow stripes in these Rainbow Fruity Cheerios Bars! If you rocked at the sorting game when you were a kid, you’ll totally kick buns at sorting a box of Fruity Cheerios into the five separate colors. Turn on the timer – really – this is a competitor’s idea of a good time. Then mix and mold the cereal into a gorgeous rainbow. Pay no attention to the man behind the curtain, but grab your ruby slippers and check out the rainbow you just made! Chop off the ends so they’re level and put your rainbow out on a nice big tray for all to admire. What a cool centerpiece for your next party! (Just keep Toto away. Way away.) To serve it, just cut ‘er up into slabs of rainbow heaven. Then pop your copy of the Wizard of Oz into the DVD player, and start munchkin munchin'! More Marshmallow Yums Try these other marshmallow treat recipes too!